While there haven't been any extravagant seat sales yet for the new Hainan Airlines flight out of Calgary like we see south of the border there is this coupon offer you can take advantage of! You can save $100 on flights until the end of September when you register for this coupon. The link to get the offer is https://apps.agorapulse.com/mobile/coupon/41056 and you'll have to access it with your Facebook account. We found the offer on Instagram and they state there are limited numbers so I would go and get it right away if you think you'll fly this route by the end of September. 1. Hainan Airlines’ Coupons are valid from March 15th, 2016 to September 30th, 2016. 2. Passengers must travel before September 30th, 2016 (return flight date) 3. Coupon is only valid on Hainan Airlines overseas website (https://www.hainanairlines.com/CA/GB/Home). 4. The promotion code cannot be used for upgrades, or charges relating to itinerary changes. 5. 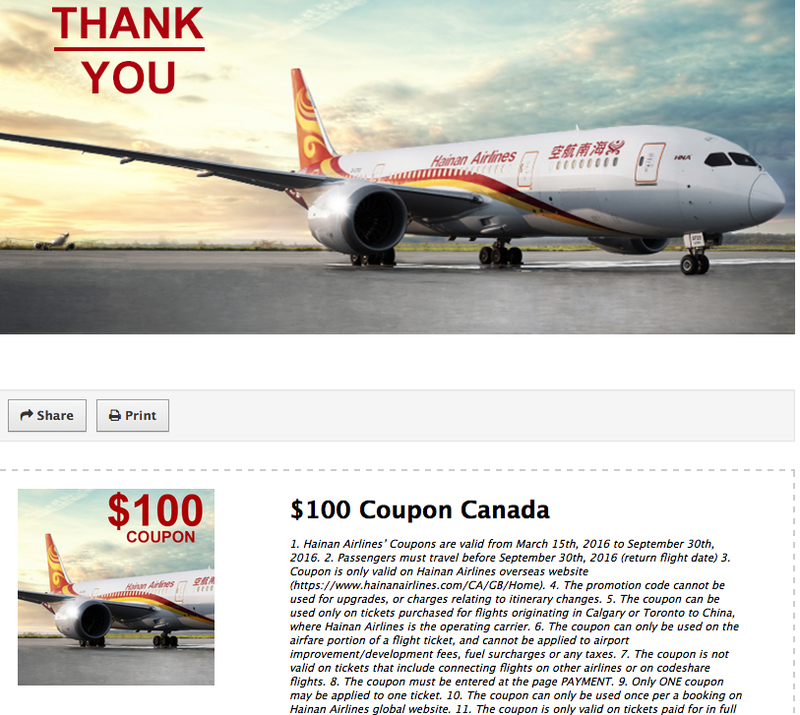 The coupon can be used only on tickets purchased for flights originating in Calgary or Toronto to China, where Hainan Airlines is the operating carrier. 6. The coupon can only be used on the airfare portion of a flight ticket, and cannot be applied to airport improvement/development fees, fuel surcharges or any taxes. 7. The coupon is not valid on tickets that include connecting flights on other airlines or on codeshare flights. 8. The coupon must be entered at the page PAYMENT. 9. Only ONE coupon may be applied to one ticket. 10. The coupon can only be used once per a booking on Hainan Airlines global website. 11. The coupon is only valid on tickets paid for in full on the Hainan Airlines website and may not be used to discount tickets purchased at any retail outlet. 12. Any refunds, itinerary changes, transfers and upgrades shall be dealt with in accordance with the original fare of the ticket. 13. The coupon cannot be used to discount cargo fees, insurance, Fortune Wings Miles discounted tickets or Limited Deals pricing. The coupon CAN NOT be applied to all other promotions (Early Bird, Save Even More, Extra Discount, ADDON, etc.) 14. Hainan Airlines has the final interpretation of authority.